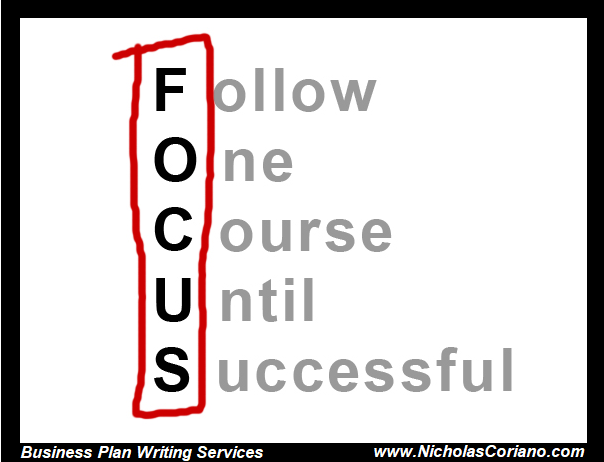 Is focus even a concept in your business plan? By Nature, entrepreneurs are extremely inviting to opportunity. This is a great thing, it propels them to new heights when opportunity works for them. But you can drown in opportunity. Many entrepreneurs have the tendency to try and execute many different business ventures at the same time. Many times, they are correlated, so it does not seem like a big deal to include them in today's business plan. But more often than not, not being able to focus on a single product or service in the initial phases of a business, leads to the demise of the entrepreneur financially. This is where Focus comes into play. You can do anything. You can do everything. You just can't do it all at once. Something is going to come before the other thing. What's my point? I have invested in over 30 properties in five states. I've built 20+ online businesses. I built a successful e-commerce business. Currently my full-time gig is consulting startups, entrepreneurs, executives and public companies on how to grow their business. Within my current workload, my focus is on developing business plans and executing marketing strategies for my clients. It wasn't until I spent 99% of my time in one venture and ignore the others that I had financial success. Spreading myself too thin among so many ventures hurt me financially. The more I focused on one venture, and just one, the faster that venture moved along and the more financial success I had. The more I spread myself out, the less money I made. And this was even true when I am talking about a single venture. For example, there was no doubt that when I spread my time between my real estate ventures and my e-commerce ventures and my business plan writing activity, that I made less money in all three areas than I would have made if I was focused on just one. 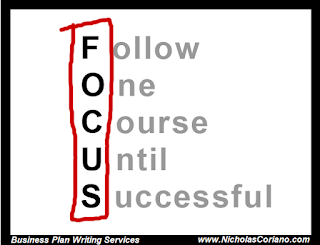 But even when I focused 99% of my time on my business plan writing and consulting business, I realize that even within that business, I needed more FOCUS. When I decided to only take on business plan clients and only marketing execution clients, did I really start to make money. This was because even within that business I was spread out. Yeah I can form your LLC. Yeah I can write your pitch deck. Yeah I can handle your investor relations. Yeah I can build your website. But it is more expensive to advertise 5 services than it is to advertise one service. And when I get a call for business plans, I have the pitch down cold. When somebody calls me for a pitch deck or a website, the pitch was a little bit different. I had email responses for anyone who wanted a business plan. If someone calls for a different service I had to type up a new email response. My point is that my focus on business plans alone made me more money. Did I sell other products and services, of course I did. But my focus on that service or product, even within my Consulting business, led to more money in my pocket. Focus. On one thing. See it all the way through. And then move on to something bigger. Too often than not, entrepreneurs give something a little try and when they have had mild success, they are done with it. Maximize whatever you try. If you're going to sell business plans, be the best damn business plan writer in the world. Sell more business plans than anyone else in the world. And then expand. Trust me your bank account will thank you.